I’ll make this real quick. I saw this recipe in the lifestyle section of Elle India last year, and the recipe is for aubergine carpaccio, from Chef Nikhil Chib of Busaba. The original recipe serves the aubergine on a bed of arugula, but I had to do without. Unfortunately, since I do not have a mandolin and because I am a little clumsy with the knife; I cannot produce slices thin enough for carpaccio. On the other hand, these aubergines aren’t sliced thick enough to be called steaks, either. These aubergines are somewhere in between. 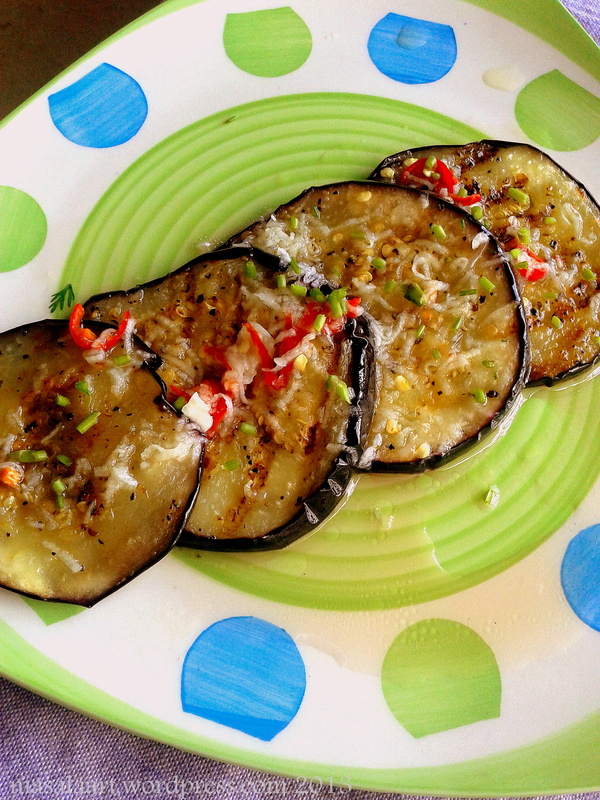 Aubergine slices. Aubergine discs. Aubergines, sliced home-style. Look, I really didn’t want to title this post CLUMSY CUTS OF AUBERGINE WITH CHILLI-LIME VINAIGRETTE. But I guarantee, this tastes great. And it can be made with so few ingredients, stuff that can be found lying around in the fridge. Lime/lemon, garlic, chilli, cilantro and a spoonful of sugar to add a touch of sweetness to the zing. Slice the aubergines as thin as you can, place in a colander, sprinkle with salt, pepper and lemon juice and toss lightly. In a small bowl, whisk together the 2 tablespoons olive oil, lime juice, sugar, chilli and garlic until the sugar has dissolved. Set aside. Heat remaining oil in a pan and fry the aubergine slices for about 3 minutes each on each side; until it is cooked through and turns a golden colour. Remove from heat, arrange on a plate and pour the dressing over it. Yeah- even at home, we used to get stuck preparing it the same way- as ‘bharta,’ smoked aubergines with chilli and spices- but there is so much you can do to it! I want to try Nigella’s baby aubergine recipe next. Oooh that sounds even nicer! The one I saw was from an episode of Nigellissima, were she baked them with herbs. Bharta is pretty good, but I guess we were just eating way too much of it!! i’m with you there. I love aubergine, esp in pasta! Going to try this recipe this weekend. You didn’t deep fry the slices, did you? (As we often do Bengali-style). I’ve started grilling my eggplants..sprinkled with olive oil and rosemary..that’s pretty good too..
Nope no deep frying…grilling also works well! And you can add any herbs you want, really. I am going to try Nigella’s baby aubergine recipe from Nigellissima next! I just want you to know that I’ve had this recipe open in my browser for days because I LOVE it and want to have it RIGHT NOW. Aubergine is a beautiful word!!! Much better than eggplant I think. Yay!! I hope you like it. Aubergine, okra…they are all just nicer sounding words for eggplant and lady’s finger! Courgette! Now that’s a word. It’s better than zucchini I think. But zucchini is more fun to type. Aah Heather, you are a girl after my own heart. Courgettes sound fancy but typing z-u-c-c-h-n-i is so much more fun. Awww thanks Prerna! I just wish that I could have sliced them finer. Love the clarity in your photo! Makes me want eggplant now! Oh thank you so so much! I am trying to take better photos. I need to invest in a new camera.